Matt Balazik, along with his colleagues at the Rice Rivers Center, has been trawling the James River for years trying to find traces of the Atlantic sturgeon, a species of fish that was declared endangered in 2012. 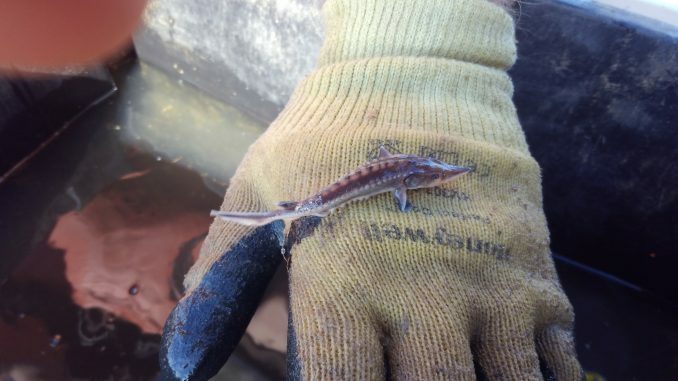 The researchers were working on this project for eight years before they began making progress last fall with the discovery of baby sturgeon in the James River — significant because of their scarcity. The Rice Rivers Center, owned and operated by VCU and located along the James River, is dedicated to environmental research and is leading the Virginia Sturgeon Restoration Team’s effort to reestablish the sturgeon population in Virginia. It receives funding from the Virginia Department of Game and Inland Fisheries and the National Oceanic and Atmospheric Administration. Initially, the researchers noticed the robust adult sturgeon population in the James River. In the last 10 years, however, there have been few young sturgeon reported in their findings. Every river population has completely different spawning patterns, and Balazik thinks some answers to the shortage of young sturgeon can be found by looking closely at these patterns. The patterns are affected a lot by the river’s flow. More flow leads to a greater chance of successful spawning. The James River has had a particularly successful spawning season this year, and Balazik attributes that to the river’s high flow. While there isn’t enough data to back up this claim, Balazik said there are a lot of factors connecting high river flow with successful spawning. For one thing, the water level’s rise allows the sturgeon to reach their spawning habitats and clean them out more easily. The sturgeons need clean, solid substrate to spawn. Their eggs are very sticky and dense, so if there’s a lot of sediment, it will build on the eggs and suffocate them.